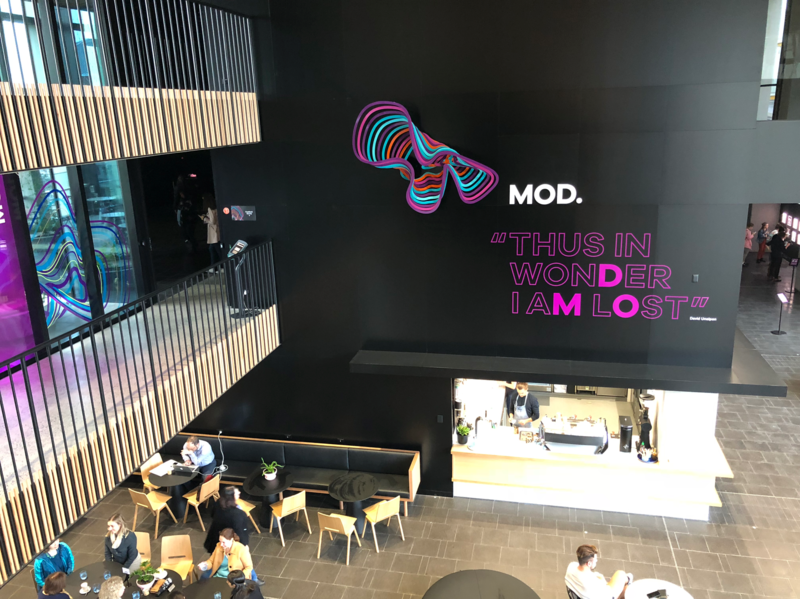 Leading exhibition and experience design at MOD. – Let's design a better future, together. 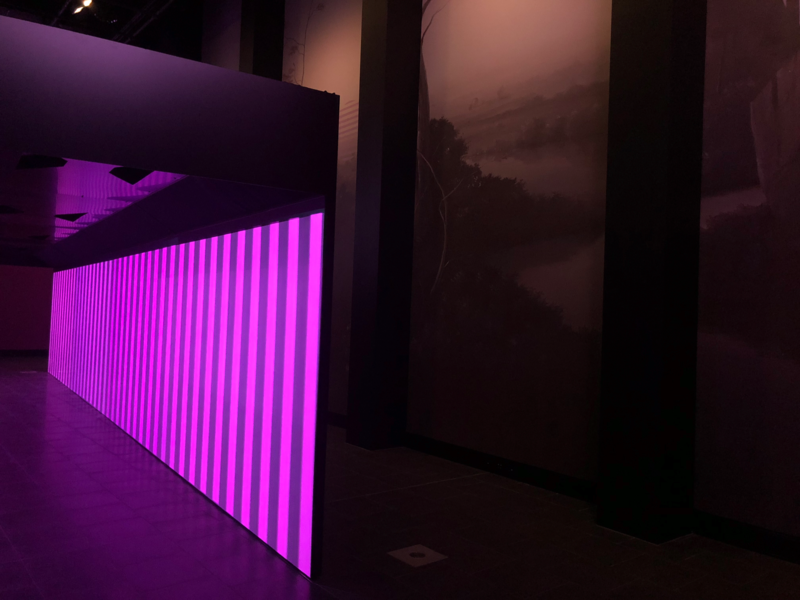 Leading exhibition and experience design at MOD. The MOD. team had 18 months to launch a brand new, future focussed museum that would encourage young adults 15-25 to engage with science, technology, engineering and maths. The MOD. team, including myself, had no prior experience delivering exhibitions, museum or gallery experiences. We were also operating as a startup within the University of South Australia and had to negotiate a high level of ambiguity – we didn’t have a building, defined processes, policies or procedures in place. Working under the Director, I led the exhibitions team ( a creative technologist/ programmer, film producer, exhibitions coordinator and program coordinator) to both design the way we wanted to work and the work we wanted to present. Understanding what we needed as a team to support the design and delivery of the exhibition. This included the processes and tools we would use, the guidelines we needed to comply with and the roles everyone would play. This was an iterative process of collaboration and co-design with the team – sometimes led by the Director and sometimes by me. I introduced the concept and practice of user centered design to the team and worked with them to develop and test new ways of working that led to a final design framework that could guide us in our process. 2. 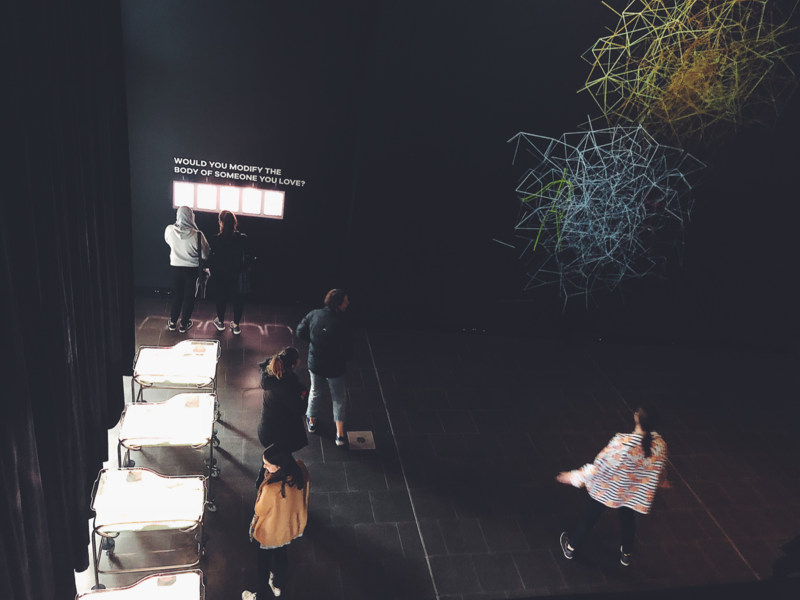 Understanding what young people wanted in a museum experience. This was split into two parts: designing directly with end-users (which I have written up separately here) which then informed the work we did as a team to creatively respond to what users were telling us with ideas, concepts and prototypes. 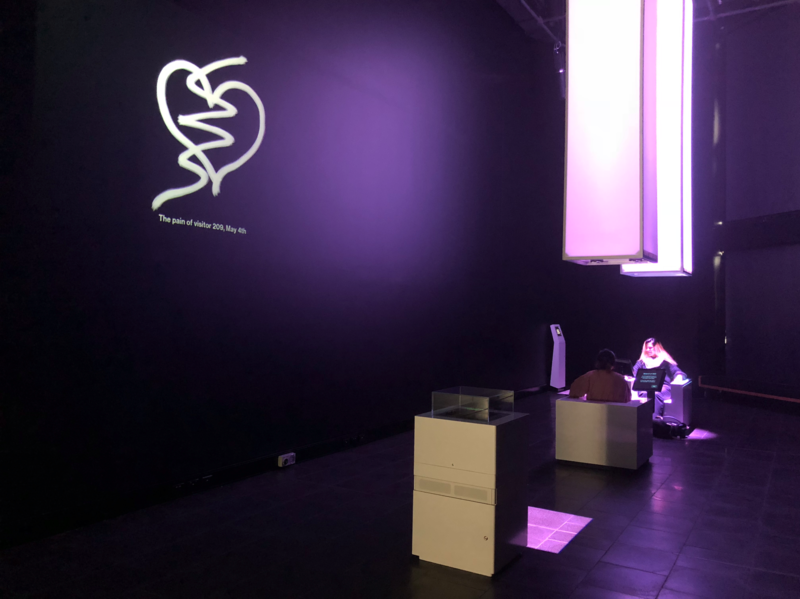 Working with the team it quickly became apparent that blank sheets of paper and ambiguity were causing people stress and, at times, was leading to action paralysis (launching a new museum goes from fun to daunting pretty quickly!). One way to alleviate this was to define a process and framework for getting from the blank sheet of paper to a museum that was ready to launch. This became the MOD. 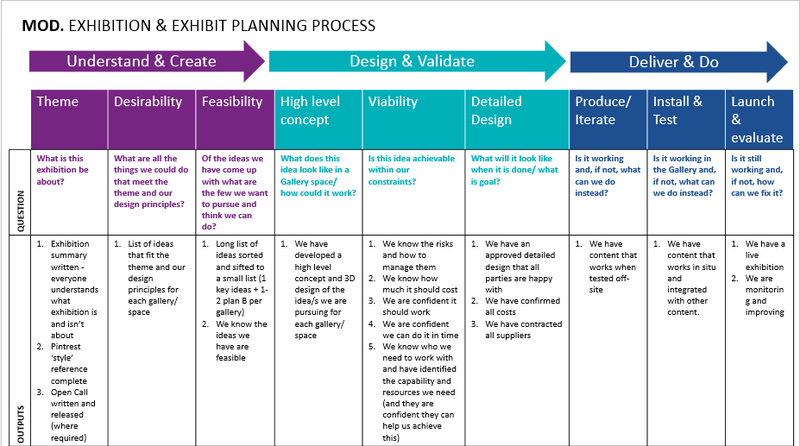 Exhibit and Exhibition Planning Process which followed a design thinking model that I adapted so that it worked for the team. We also developed a set of overarching Design Principles that could act as decision-making tools and prompts as we were designing. Asana with a Gantt chart plugin to map individual projects streams that were clustered around gallery spaces. I managed the overall program of work and made sure everything stayed on track. User and prototype testing. In the early stages this was facilitated via our MOD. CoLAB, once we had things in situ we organised groups of 5-10 young adults to come and walk through sections of the museum and explore in an open-ended and unprompted way. We observed their behaviour, took notes of places that they loved or got stuck and then asked a bunch of clarifying questions at the end. The design process we undertook as a team saw us kill more than 21 ideas for exhibits based on a range of factors including user feedback, budget, complexity and non-alignment to our design principles. Team feedback shaped the processes and templates I created – our team were doers more than readers and needed simple tools that could be easily pulled off a shelf to guide them to do what they needed to do quickly. User feedback saw us continue to tweak exhibits even after we opened. I have written up what they told us and how it influenced the end exhibition in more details elsewhere. Projects were diverse and included an augmented reality art exhibition, immersive science/ art installations exploring the neuroscience of pain, biomimicry and aeriel robotics, interactive digital storytelling around Aboriginal science and the creation of a teenage robot called ‘Josh’ as well as visitor experience projects like way finding and building the MOD. website. MOD. launched in May 2018 and saw 50,000 people visit in the first 6-months. The reviews, from both visitors and the media, have been overwhelmingly positive. You can see the reviews on Google here and selected media coverage below. Ambiguity isn’t always creativity’s friend: Building MOD. was an experience like no other but it taught me a lot – especially about how people navigate ambiguity. I saw this both in terms of myself and the team and users we tested with – the common insight that seemed to underpin everything we did was that, while people like space to roam, they really thrive with some parameters. The team was daunted by a blank page but empowered when given a structure within which to create, users found too much of the unexpected a big turn-off. Creativity to come up with new ideas is enabled by building confidence in people’s unique strengths and giving them the space to run with that – at least for a while. It is enabled via lateral thinking, stepping outside the familiar and looking at what others are doing to stretch your thinking. It’s also about clashing unexpected things together, seeing what flies and having lots of robust discussions about a broad range of things. But you can’t do this forever. Reality will kick in, you’ll need to draw a line around those ideas and move into delivery. This transition from thinking to doing can cause angst for creative people.